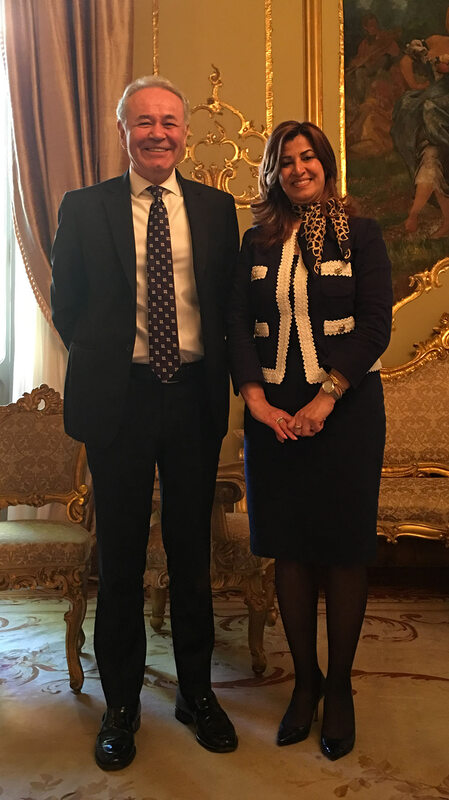 Today Mrs. Kader was invited for lunch by the Ambassador of the Republic of Turkey in Italy, Aydın Adnan Sezgin, accompanied by Counsellor Tugba Alan at the Embassy of Turkey. The talks focused on the current situation in the Kurdistan Region including the economic - financial crisis in progress, the evolution of resistance against the ISIS terrorists, the relationship with the central government, the relations with neighboring countries, in particular the relationship of friendship and mutual cooperation existing with Turkey. Mrs. Kader expressed to the Ambassador the need for further support from the international community in economic - financial and military terms to deal with the fight against ISIS and the humanitarian emergency on site. The Ambassador expressed solidarity and support for the Kurdistan Region. He commended the role of the Kurdistan Regional Government in the fight against terrorism and in the stabilization of the area. He stressed the need for stronger action especially by USA and appreciated the role of Italy in the military and humanitarian field in Kurdistan. It is necessary as soon as possible to proceed with the release of Mosul and allow the thousands of families return to their homes. Mrs. Kader added that the Holy See is playing a very important role, sending delegations, supporting the action of the Christian Catholic-inspired NGOs, but also by establishing a Catholic University on site that will be a benchmark in the field of training not only for Christians but for all young people regardless of ethnic – religious affiliation in order to restore peace and stability in the area. The meeting concluded with the wish to intensify more and more the relations between their respective countries and diplomatic missions in the political economic and cultural field and with the desire of Amb. Aydın Adnan Sezgin to visit as soon as possible the representation office of KRG in Italy.